McBurney, Anne (nee O’Boyle) February 10th 2019. Peacefully at hospital after a short illness, late of Bangor. Dearly loved wife of Jack and much loved mother of John, Alan, Stephen and Edmund. Reposing between 6-8pm on Wednesday 13th February at S Clarke & Son, Funeral Directors, 64 Newtownards Road, Bangor BT20 4DR. Funeral Mass in St Comgall’s, Brunswick Road, Bangor on Thursday at 10.00am. Followed by a family cremation at Roselawn Crematorium. 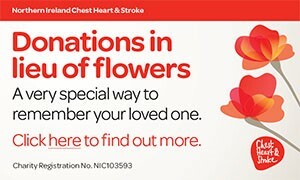 No flowers please, donations may be sent if desired to McDermott Unit, Ulster Hospital c/o S Clarke & Son, Bangor. Will be sadly missed by her loving husband, sons, daughter’s-in-law, grandchildren, brothers, sisters and the wider family circle. I am sorry to tell you that Anne McBURNEY has passed away.